Hi-Float: 5 fl oz. Bottle There is 1 product. Sold in a 5 fl oz. bottle. 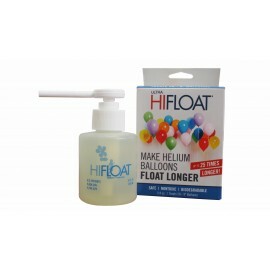 Hi-Float is used to make your latex helium-filled balloons float longer by preventing helium leakage! Simply add some of the Hi-Float liquid to the opening of the balloon and make sure it coats the inside of the balloon opening. Your balloons are now ready to be filled with helium!